A Lawrence County man has found himself in one big pickle of a unusual situation, after he was arrested this week in a neighboring county for a somewhat unusual criminal charge that rarely happens these days. 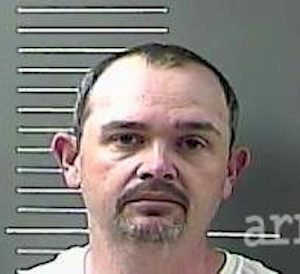 William R. Skaggs, 37, of Blaine, was arrested early Tuesday evening November 13, in West Liberty, Kentucky, which is in Morgan County, Ky, by the West Liberty Police Department. They charged William Skaggs with the criminal offense of: BIGAMY. In plain legal English, Mr. Skaggs is accused of illegally carrying on separate matrimony acts of having TWO Mrs. Skaggs. In Kentucky, the criminal charge of bigamy, or being unlawfully married to two persons at the same time, is a Class D felony, which is punishable by from 1 to 5 years in prison. According to the Kentucky state law statue on bigamy, (1) A person is guilty of bigamy when he: (a) Purports to marry another person knowing he has a husband or wife or knowing the other person has a husband or wife; or (b) Cohabits in this state after a bigamous marriage in another state. However, according to the same law statue (2) It shall be a defense to bigamy that the accused believed he was legally eligible to remarry. After he was was arrested on the bigamy charge, William Scaggs was transported to the Big Sandy Regional Detention Center in Paintsville (even though Morgan County is not one of the official 4 county charters that use the regional jail; however law enforcement in Morgan County and the their jailer office has routinely been bringing their arrest suspects to be lodged in the regional jail in the past couple of years). Details are scant at this time, but William Skaggs was released after he posted his bail bond on Thursday. The Levisa Lazer will report more information on this bigamy case, as facts in regards become available. Probably just walked off and left one. Sad, with all the evil in this world that they go after a man that probably thought he had been divorced.. This is crazy. I feel sorry for him and his family. He knew he was married. He left his wife years ago and rarely wants anything to do with his son. So. He knew what he was doing. He is just too cheap to pay for the divorce.